Yes, there was a second night at Malt Bar South Park. But, as logic would dictate, if there was a second night, then there was also a first. 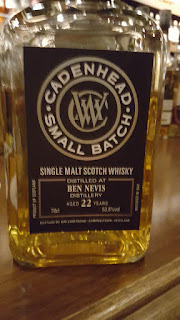 Because the atmosphere (and music) made for a perfect drinking experience, I'm going to be silly and give these whiskies number grades. Of course more Ben Nevis. Nose - Lemons, grapefruit, berries and anise. A hint of alcohol showing through. Palate - My kind of BN. The aromatic herbal and lightly peated note bursts through instantly. Fudgy chocolate, earth and cantaloupe. Finish - Honey and cantaloupe, with a lovely round herbal bitterness. Words: It's bang on, as I think some people say. The nose and palate are quite different, both are good, though the palate gets the edge here. Very solid overall, though complexity isn't its strong point. Nose - Islay, GTFO. Springbank has beaten you at your game. Raucously medicinal, full of disinfectant and bandages. Clay, plaster and seashells. An old hospital. Gone mad. By the sea. Palate - Dirty. Dirt. Direct. Dynamite. But never hot. Horseradish, barley, and soil. Hints of white fruits and sugars. Mmmmedicinal. Finish - Similar to palate, but friendlier. Medicine drops back, barley and white fruit move forward. Again, no heat. 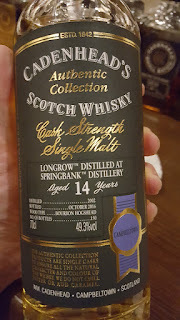 Words: Longrow had been letting me down recently, but this restored my confidence. Dear Springbank, more of this please. Cheers. Nose - A French patisserie: cocoa, vanilla extract, marmelade, figs and pineapple. Palate - A happy absence of generic sherry raisins. Instead it's full of mint and chocolate and vanilla ice cream. The tannins roll in but don't overwhelm. Plenty of oak spice. Grows sweeter with time. Finish - Roasted notes, toffee, some decent tannins. Neither mouth-drying nor hot. 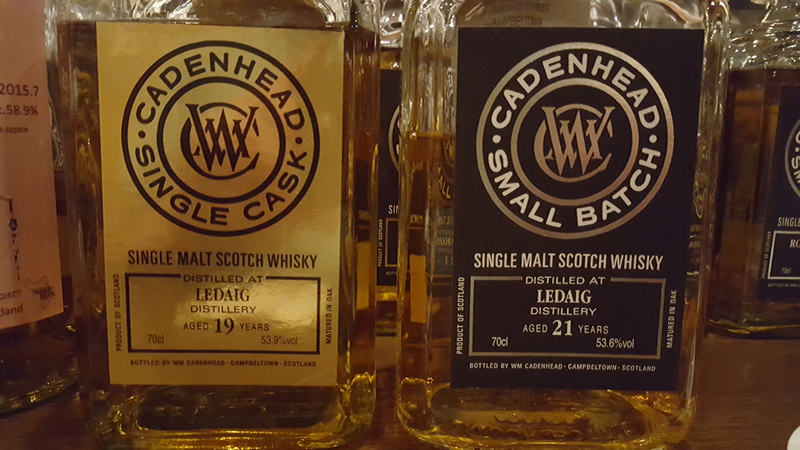 Words: The 21st year may have been the longest this whisky could take the oak. It walks right up to the line. 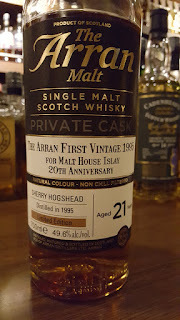 Usually 10-15 years is my preferred Arran window, but this makes for a good dessert whisky. Gorgeous nose on it. Nose - Barbecue, seaweed, fishy. Tsukiji Market after hours. (Sorry.) Smoke. Palate - Oh, rugged after all these years. Dirty and bitter, but in that great way. Big salt and smoke. There's a hint of sweetness that wiggles up, then gets stomped back down. Finish - Smoke, salt, pepper and cigarettes. From my notes: "this whisky hasn't showered in three days." Right? Words: This was so very spirit-forward, that I'm not surprised they still got 252 bottles out of this 19yo hoggie. ❤ The oak went out for a smoke. Nose - Huh. It's much neater. Less of the seaweed and fishiness. Instead there's a sambuca-like anise, hints of vanilla, cream puffs, apricot jam and maple syrup. Palate - Less peat to this one than its younger sibling. But very very barley. Big on baked treats. A little bit of salty butter. And, "toffee without the sweetness. Figure it out." Finish - A little bit of its sibling's smokey salty stuff. But also barley, citrus, sweeter herbs and spices. Words: Less of a fighter than the 19yo. It's great in a different way. More balance, more fruits and sweets. 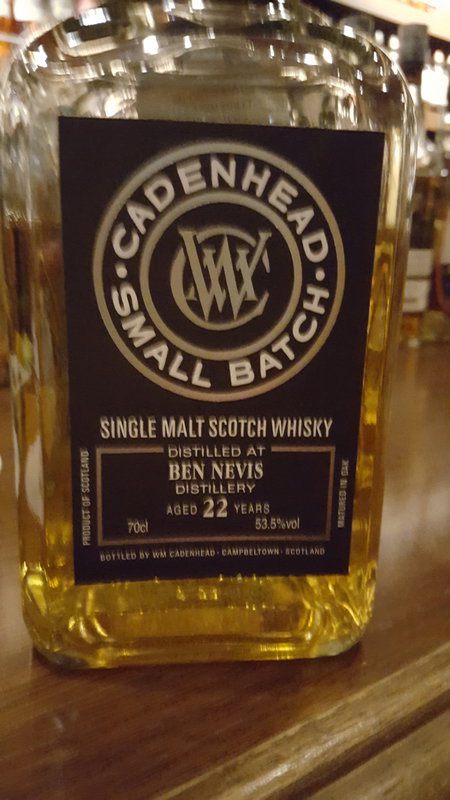 Perhaps a Ledaig for more sensitive sippers? Good news all around. I regained faith in Longrow. Got some confidence in Cadenhead's Ledaigs. Ben Nevis and Arran also showed well. And I received a great little snack plate for my seating charge.